Not to open a can of worms as it were, but I thought this site was to help promote the sustainable collecting of wild produce, as well as edible plant identification. By sustainable I mean taking enough for us humans to enjoy as a treat but leaving enough for wildlife to eat as an essential to survive winter. Some of the posts though show such large quantities being collected which will quite possibly impact on wildlife survival, including birds, squirrels, mice, voles etc. Do we humans always have to be greedy at the expense of other creatures? and towards the end included suggestions about heating up the can of worms on a bonfire, but being sure to leave some worms in the can for the blackbirds, and whether it's best for a blackbird to learn to use a can opener, or simply train a human to do it as and when required. 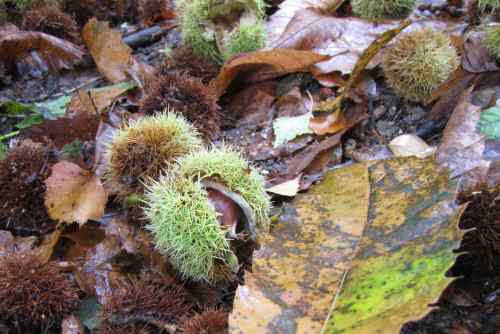 Chestnuts. Should I leave these for the woodland animals? While I'm all for respecting and supporting wildlife, I have several problems with this position (the original post, not teaching blackbirds to use can openers). Firstly, while this point of view is common amongst foragers, it's very rare amongst gardeners. It may just be that there are two groups of people with very different standards, but I suspect that the concept of ownership has a lot to do with it. In my garden, where I have toiled and nurtured, the plants are mine and I'm entitled to harvest all of them, with no regard to what the wildlife might want. Indeed, gardeners go to great lengths to protect their crops from being eaten by other animals, and it's very rare to hear any disapproval of this behaviour. 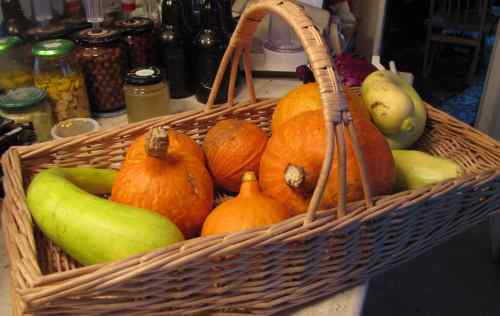 Squash. How about these? Should I have left these too? It's not just the inconsistency that bothers me; this highlights what the alternative to foraging is. Gardening is akin to farming: Deliberate cultivation of crops on land designated as being for that purpose. One viewpoint expressed in the facebook debate was that we don't need to forage if we can afford to buy our food from shops, implying that this is the default, neutral position. Let's think about that, shall we? Food bought from shops is farmed, almost universally. There's a spectrum of farming practices, but they all involve identifying pieces of land as farmland and making efforts to keep wildlife from eating the crops on that land. People may debate the methods used, but does anyone say to a farmer, You must leave those caterpillars alone, they have as much right to the cabbages as you do! ? Actually, it's possible that some people might say this, but I think you'll agree that this is an extreme point of view. It's generally accepted that farming involves keeping as much of the crop as possible for humans, not caterpillars. If the default, neutral position involves, at the very least, displacing wildlife, what then of foraging? Taking wild food certainly deprives other animals of it, but otherwise doesn't disturb them much, unlike farming. Foraging, then, surely has a lower impact on wildlife than farming. The next question has to be whether foraged food supplements or replaces farmed food. In other words, do we eat just the same amount of farmed food when we forage, or do we eat less? The answer to this is not straightforward. One possibility is all the food that is necessary for survival and good nutrition comes from farmed or home-grown sources. In this scenario, any foraged food is additional to this, treats and luxuries that we simply wouldn't have if we didn't forage. Another possibility is that when we forage, we reduce the amount of food we eat from other sources. Even if the type of food we forage ends up as luxuries, for example sloe gin, we would have bought some equivalent luxury, perhaps another liqueur, if we didn't have the foraged food. This second possibility also covers cases where foraged food replaces more essential food items, such as foraged nettles or fat hen substituting for spinach or spring greens. If the first possibility was mainly the true situation, then foraging really would be an additional impact on wildlife. There would be a simple choice between taking wild food and not taking it. However, I think the second possibility is much more likely to be true. We do not add to our diet with foraged food, we replace some of the farmed food with wild. The person who started the recent debate, who is far from alone in this view, considers wild food to be treats for humans, but essential for wild animals. Even for those whose foraged food is only sloe gin or blackberry and apple crumble, which are certainly treats, I think this misses the point if - as I suspect is usually the case - these treats are substitutes for alternative treats. Even with treats, foraging is an alternative to farming, not additional to it. What really bugs me about this point of view, though, was expressed by another member of the facebook discussion. It reflects a view of human beings as separate from the natural world. The bounties nature world are not for us, they are for wild animals. We have other sources of food, other than what we might forage. This treats the farms where our food is grown as being apart from nature; as having no impact on it. Of course, people who express this view are not thinking about the farms, but that's part of the problem. When you think about it, farmland obviously has a huge impact on wildlife. Everything we do interacts with nature, because we are part of nature. Just like all the other wild animals, we have to eat, and that food has to grow somewhere. 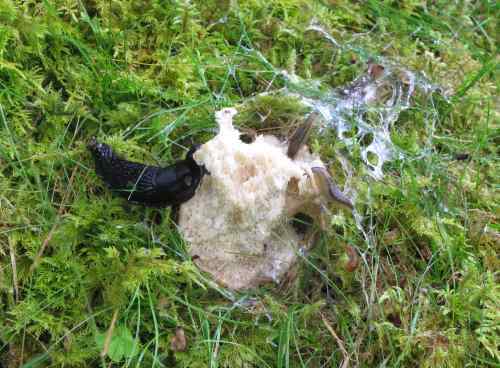 From the point of view of being one animal amongst many, and needing to feed myself as much as any other animal does, I feel that I have as much right to nature's bounty as the next animal, especially when the next animal happens to be a slug. One mushroom - a cep, I believe - that I didn't get to first.